This book will help every executive–especially those middle managers caught in the middle, between bureaucratic structures and the need for profitability–deliver the organic growth that is demanded of them. It also will help their bosses–the C-Suite executives–unleash the corporate creativity lying dormant with the organization. The Catalyst speaks to all managers who have ever been handed ambitious growth targets but little guidance on how to hit them. Managers like you who, year in and year out, face “the terror of the plug.” The boss expects you to deliver a daunting revenue target but offers little advice on how to get there. Even worse is “growth gridlock,” when your company won’t support your great ideas until you prove they’re good–which is impossible since you can’t get the proof until you’ve tried them out first. Stuck between a rock and a hard place, you spend your time persuading with PowerPoint presentations instead of pursuing opportunities. What does it take to overcome such seemingly insurmountable roadblocks? How can you crack the code to discover and pursue new opportunities? How can smart organizations recruit growth leaders, train them, and learn from them instead of getting in their way? These are the questions explored in The Catalyst. 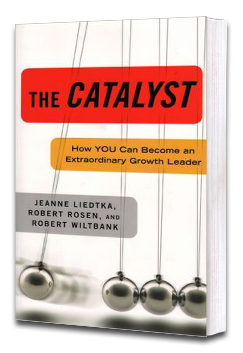 Based on years of research, this inspiring book reveals that the most potent drivers of growth are unsung heroes who often go unnoticed: ordinary middle managers who do extraordinary things.